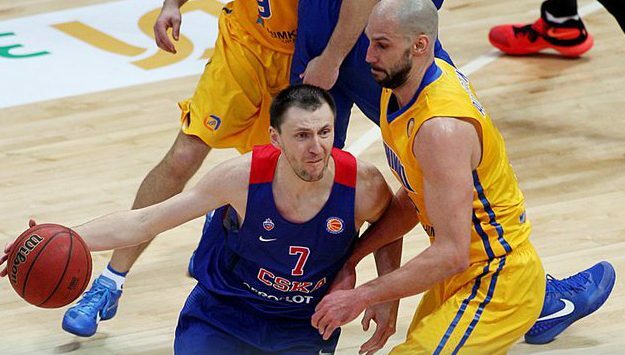 In the derby of Moscow, CSKA was clearly superior than Khimki, perhaps winning more easily than what the final score reveals. In the derby of Moscow, CSKA (19-1) was clearly superior than Khimki (14-4), perhaps winning more easily than what the final score reveals. The two teams keep their positions as 1st and 4th in the standings, respectively. After a close first period, coach Itoudis’ players got a 6 point lead at halftime, with a buzzer beating 3pointer by Nando De Colo. Although Khimki got ahead again thanks to the efforts of Alexey Shved and James Augustine, the bench solutions of Nikita Kurbanov and Victor Khryapa gave the guests “wings” which flew them even higher than before. The latter it made a 10 point game in favor of his team, 62 – 72 at the end of the third quarter and his team never looked back, increasing its deficit even up to 16 points. Although it played with fire near the end with a series of careless plays and mistakes, CSKA‘s double digit safety pillow was enough for the final victory. Unics Kazan is second in the standings with a 16-2 record and Zenit is third at 11-3, while Lokomotiv Kuban is fifth (12-5).